Work to be done in December needs to ensure socio-economic goals set for 2018 are accomplished or exceeded to create a springboard for the implementation of 2019 plan, said Prime Minister Nguyen Xuan Phuc. At the Government’s regular monthly meeting for November held in Hanoi on December 3, the Government leader said over the past 11 months, ministries and sectors proactively took prompt and proper countermeasures against complicated global economy effects. Production and business performance has been faring well and businesses have had stronger confidence in the country, creating favourable conditions for the future socio-economic development, he said. Localities, ministries and sectors, however, should not become neglectful, he said, adding that they need to drastically implement set measures and solutions during which office heads need to heighten their responsibility, administrative disciplines enhanced, administrative reform sped up, and existing problems addressed. “Localities, ministries and sectors have to work to persistently safeguard the country’s strategic interests,” the leader said. He noted that all innovative ideas and technology applications that bring wealth for the country and people are welcomed and encouraged, saying this issue should be a focus of works to be done in not only December, 2018, but also in the whole 2019. The work required to be implemented in December included the refining of a draft of Resolution 01 of the Government (Resolution 01/CP), which, the PM said, needs to reflect “a high determination and a revolutionary spirit of the Government” in accomplishing tasks and plans outlined for 2019. “The lowest GDP growth rate should be 6.8 percent,” he requested, asking those involved in compiling Resolution 01/CP to have solutions to unlocking bottlenecks in socio-economic development while achieving a higher growth rate than that of 2018 with secured macroeconomic stability and growth quality. “What people want from us is the quality of growth and the handling of social problems,” the leader said, asking ministries and sectors to “think out of the box” and step up technology application in all aspects of life. The leader asked ministries and sectors to focus on providing sufficient amount of commodities for people in the upcoming Lunar New Year festival 2019, especially gifts and financial assistance for those who rendered services to the nation. He mentioned to the tasks of ensuring traffic safety and fighting crimes, trade frauds and smuggling. He pointed to the need to ensure supply and demand of the market and credit capital to meet the national economy’s needs in the last month of the year, reiterating the request to stringently tackle “loan sharks”. 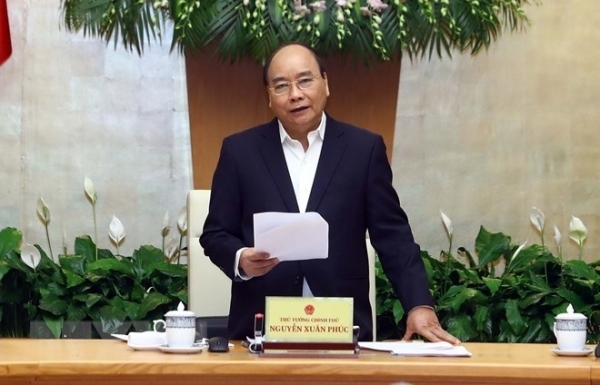 He also repeated the functions and tasks of a special working group headed by Deputy Prime Minister Truong Hoa Binh to inspect the slow handling of denunciations lodged by businesses and people at localities. According to the Ministry of Planning and Investment, the macroeconomic situation remained stable since the beginning of the year. The consumer price index in November fell by 0.29 percent, the lowest in nine months. Trade surplus hit 6.8 billion USD while there were over 121,000 newly-established firms with a total registered capital of 3.4 quadrillion VND (146.2 billion USD) during the 11-month period while nearly 32,000 enterprises resumed their operations. More than 14 million foreign tourists arrived in Vietnam in the past 11 months, up 21.3 percent.